Thermal Image Overlay is just that, a thermal image transposed over a visual image using matching Field Of Views (FOV). The combined image provides for a whole new visual experience. A thermal signature with daylight spacial awareness that cannot be realized through Thermal Imagery alone. To achieve usable Thermal Image Overlay two camera modules are used with the same viewing angel,one Thermal IR Imager and the other a Visual HD Daylight camera, mounted side by side. The image information is overlaid using specialized software. The user can select a level of transparency, thermal range, image size and zoom offsets, allowing the two image types to be accurately corrected with or without X/Y offset. Thermal overlay is now possible due to the massive leaps made in the field of Thermographic sensors. Thermographic sensors have the ability to see surface temperatures which emit IR light. The performance of these new low cost thermal sensors are exceptional. Thermal sensitivity of 50mK or the ability to differentiate variations in temperatures of 1/20 of a degree Celsius. The result is further enhanced by setting a thermal thermal ranges, specific to the application. This allows the visual camera to provide standard imagery delivering depth of field and enhanced orientation awareness while the thermal sensor overlays the targeted thermal image detail. For example the targeted thermal information may be set to body temperature ranges for perimeter security application. Where as in the case of electrical or mechanical applications the temperature ranges are higher so as to detect equipment alarms or thresholds that may trigger preventative maintenance alerts. This feature alone has great value in many applications. 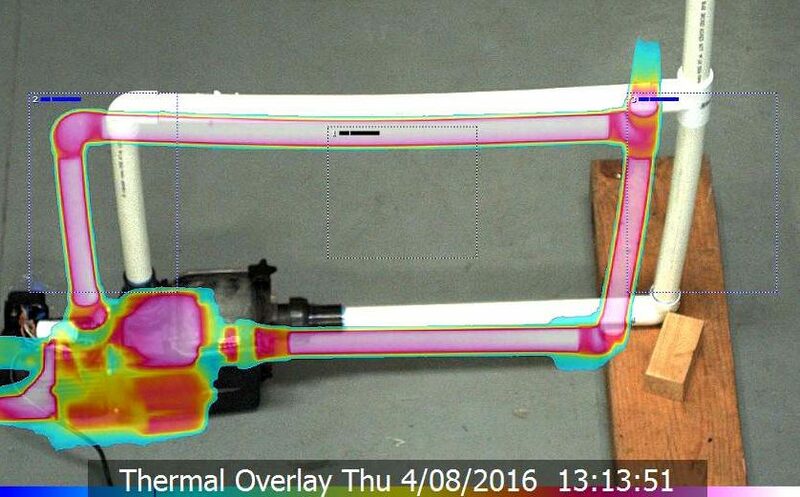 Thermal overlay on Tracam is now real and available. The ability to mount such a compact effective payload on Tracam delivers the enduser a far superior ROI, not to mention the application specific advantages. The featured image tagged to this article demonstrates the thermal overlay function on Tracam – Note the image Offset; this is optional and may be preferred when used in a mechanical environment. Short Thermal Overlay Video – A closed loop water pump test jig, with motion detection and with image offset disabled. Short Thermal Overlay Video -Tracam moving to a preset location and viewing closed loop water pump test jug with image offset enabled.